Next up on Earth Mantra is Bake Sale, a sublime pair of ambient pieces by Burning Artists Sale, a collaborative project between Barbara Vesey and Kevin Haller. Two very different tracks constitute this enchanting release, one a live performance and the other a studio composition. Given their differences, let us examine each in detail. The first piece, called The Opposite of Antithesis / Vermillion was recorded live at the Kansas City Regional Electro-Music Festival in July of 2010, a performance we were privileged to see in the flesh. Folks, if you have the opportunity to see Burning Artists Sale perform live, you should take it, for this was one of the most moving ambient sets we have ever experienced. Played alongside a companion video that showed old family movies from Vermillion, South Dakota, and Estes Park, Colorado, the music created an atmosphere of pure nostalgic magic, truly something that had to be experienced directly to be fully understood. Fortunately, the recording of the performance captures the charming essence of that experience, and allows us to bring it to a larger audience. The second track, enigmatically entitled the dusty trail, having been hit, with an oddly tuned whistle, is very different from the first, a studio-produced composition of great subtlety and depth. But despite the difference in format from the first track, this piece retains a similar aura, an almost wistful reminiscence that evokes times long past and places long forgotten, almost like a collection of black and white photographs on our grandmother's wall, pictures of people no longer with us whose stories will remain mysterious forever more. Truly a gorgeous composition, and one that moved us deeply. Fans of Eno and Fripp will particularly be interested in Bake Sale, as we find some parallels between their work and the work of Burning Artists Sale. Maybe it is in Vesey's immaculately tasteful, slightly abstract piano work, or perhaps it is in Haller's carefully orchestrated guitars, or some combination of the two. But whatever the influence, we find the music of this album to be remarkably soothing, with just the slightest hint of bittersweet, the kind of music we want to hear again and again. 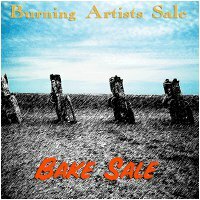 So with great pleasure, we offer to our listeners Bake Sale, the first release on Earth Mantra by Burning Artists Sale. We hope to hear much more from these talented artists in the future. Highly recommended. An astonishing release that will need several listenings. So far, I can say both pieces have a naive charm and a strangely awkward touch. But there is a lot of depth to explore. ooohhhh, that was lovely...it was really nice to hear a collaboration between the both of you!!! Great work!Beautiful soundscaping!Congratulations to both of you!A.K.